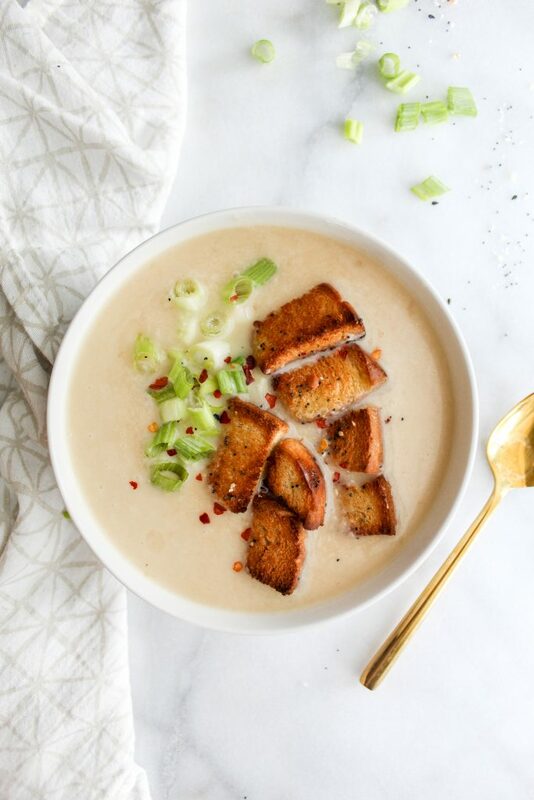 This Cheesy Cauliflower Soup is so delicious! Made with only 6 ingredients, it’s creamy, cheesy and is loaded with everything bagel seasoned croutons. I promise it will be your new go-to soup! Alright, so based on the Apple Crumble Bars with Cinnamon Spice Glaze I just posted, you guys can probably guess that I’m so ready for Fall. Like, so ready that I almost got all of my Fall/Winter clothes down from my closet the other day to switch out with my Summer garb. But then I checked the 10 day forecast and 1) cried and 2) realized that even in mid-September the temperature will be in the mid 80s. But you know what? That’s okay. Because I have something that I’m so grateful for: central air conditioning. AKA I can turn down the AC in my house to make it chilly and I can put on a big sweater and leggings and make this soup and my heart can be in its happy place. Judge me if you will, but you know soup tastes better when you’re a little bit cold. 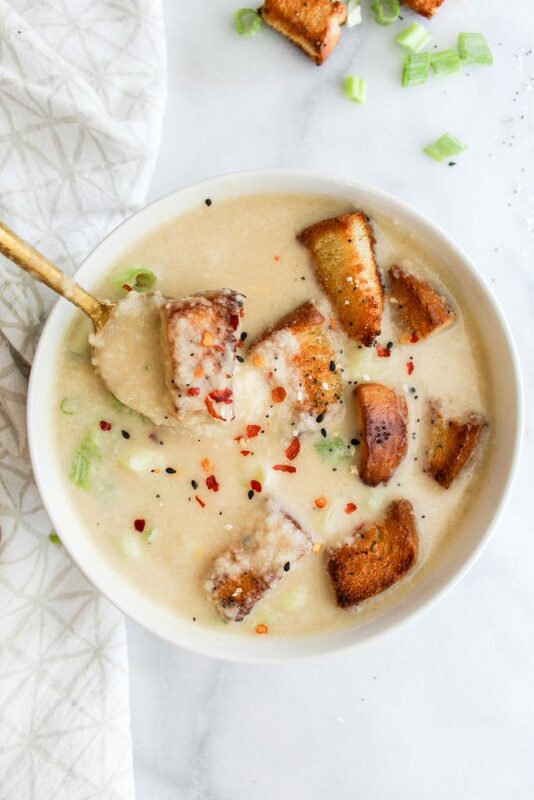 Oh, and speaking of soup…this Cheesy Cauliflower Soup with Everything Bagel Seasoned Croutons has my mind spinning right now. It’s full of extra easy minimal ingredients and it’s one of those soups that isn’t super high maintenance. As in, you can just let it sit on the stove while you go watch your fave show. Me? I’m currently binging Bachelor in Paradise and I simultaneously hate/love myself for it. Okay, so, back to the Cheesy Cauliflower Soup. The star of the show is of course, the Cauliflower. 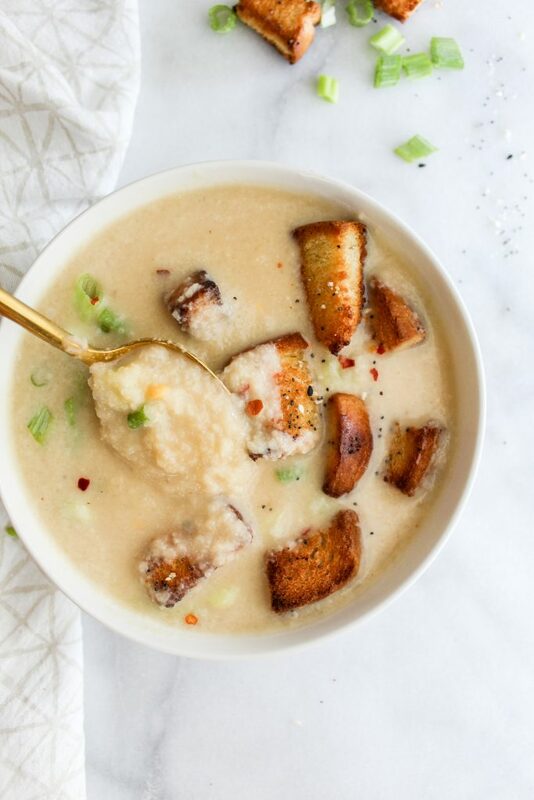 The flavor really shines through and makes this soup a winner. It’s creamy but not extra thick, it’s cheesy but not overwhelmingly so. However, the MVP of this recipe has to be the Everything Bagel Seasoned Croutons. Oh yes. I went there. I basically took the softest white bread (yes, not sprouted – gasp!) and sliced it into large chunks. I laid the chunks out on a baking sheet and coated them in oil and the famous Everything but the Bagel Seasoning from Trader Joe’s. If you haven’t heard of this seasoning yet, you’ve probably been living under a rock. It’s basically everything (hehe pun intended) that you would find on an everything bagel: black and white sesame seeds, minced garlic and onion and poppy seeds. It’s savory and delicious and a welcome add to any meal! If you’re interested in more recipes with it, check out my Everything but the Bagel Avocado Toast recipe or it’s featured on my 18 Favorite Trader Joe’s Items! So. 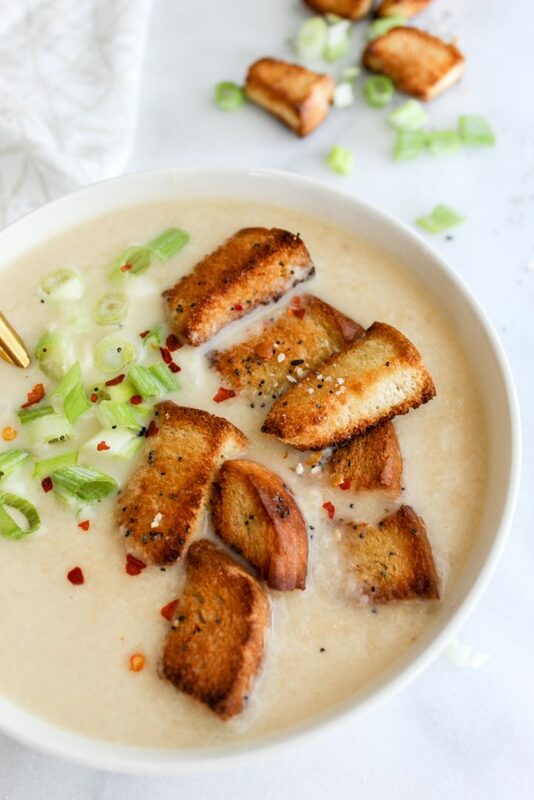 Cheesy Cauliflower Soup. Loaded with Everything but the Bagel Seasoned Croutons baked to crunchy perfection. Topped with lots of fresh green onion and red pepper flakes for some spice. Creamy + Crunchy + Fresh + Flavorful. Yesssssss. Let me tell you how I did it! First, you’re going to want to slice the onion into pretty thin pieces. Next, get out a large pot or dutch oven. Melt the butter in the pot on medium low heat and then add in your onions. Let them sit in there until they get caramelized and extra delicious with a wonderful golden color. This takes about 10 or so minutes. Once those are done, add in your garlic and stir around for an additional 1-2 minutes. By now, your kitchen is gonna smell AMAZING. Add in your chopped cauliflower florets and the broth. Let it sit and simmer in the pot on medium low heat for about 10-15 minutes or until the cauliflower can be pierced with a fork easily. Next, I used a blender to blend up my soup until I reached my desired consistency. You can also use an immersion blender. IMPORTANT NOTE: If you’re using a blender, please double check that it is a heat safe blender. This soup is very hot and I wouldn’t want the blender to shatter! If you aren’t sure, you can always wait until the soup has cooled and then warm it back up on the stove once it has blended. Once it’s all blended and creamy – I placed mine back in the original pot to keep it warm on the stove. While it was warming, I diced the bread into the large chunks. I placed them in a single layer on a baking sheet and coated them with oil. As in, I drizzled olive oil on them and then took my hands and made sure each bread chunk was fully coated with the oil. Then I added the wonderful Everything Bagel Seasoning. Oh yes. I popped those babies in the oven at 450 for like, 3-5 minutes and they cook FAST. They are so extra crunchy and delicious and I 1000% promise you that you’re going to want to eat them by the handful but REIGN IT IN, SISTER. You gotta top your soup with those golden nuggets of deliciousness. In addition to the Everything Bagel Seasoned Croutons, I also topped my Cheesy Cauliflower Soup with fresh green onion (like a lottttt of it) and red pepper flakes. It makes for the perfectly flavorful, crunchy yet creamy soup. Hello, Fall? Are you there? 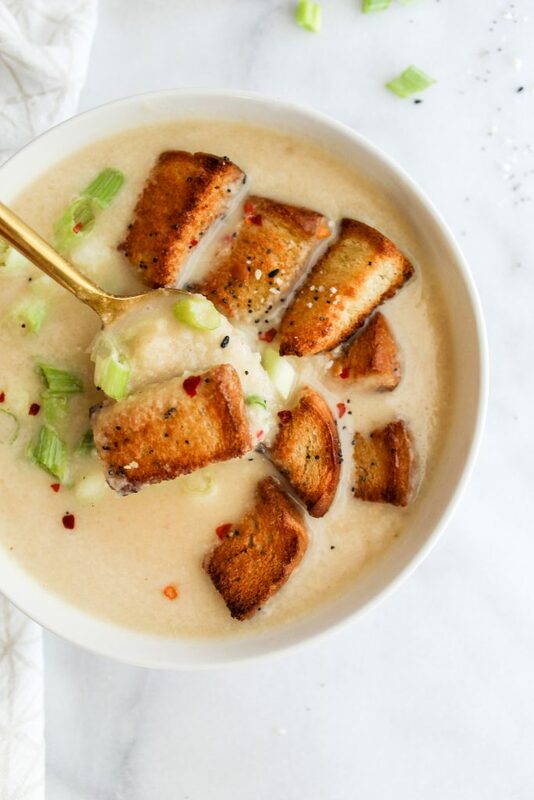 This Cheesy Cauliflower Soup with Everything Bagel Seasoned Croutons is HERE FOR YOU. 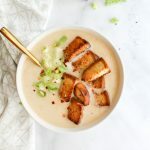 This Cheesy Cauliflower Soup is so delicious! Made with only 6 ingredients, it’s creamy, cheesy and is loaded with crunchy everything bagel seasoned croutons. Preheat oven to 450 degrees. Slice your onions in long thin slices. Mince garlic. Chop your head of cauliflower into florets. Dice your bread into large chunks. Set aside. Melt butter in a large pot on medium low heat. Once melted, add in your onions. Cook until deep golden and caramelized, around 10 minutes or so. Add in garlic. Cook for 1-2 more minutes. Next, add in your cauliflower florets and the chicken broth. Stir around to combine and then let it sit on low heat to simmer for about 10-15 minutes or until cauliflower can be easily pierced with a fork. Once done, add to a heat safe blender or use an immersion blender and blend to desired consistency. Add back to pot. Add your cheese and stir into the soup until it's melted and the soup is creamy and perfect! While it's still warm on the stove, place the bread chunks on a baking sheet. Drizzle them with olive oil and the everything bagel seasoning. Using your hands, make sure each piece of bread is covered with the seasoning and oil. Bake for 3-5 minutes or until golden brown and crispy. 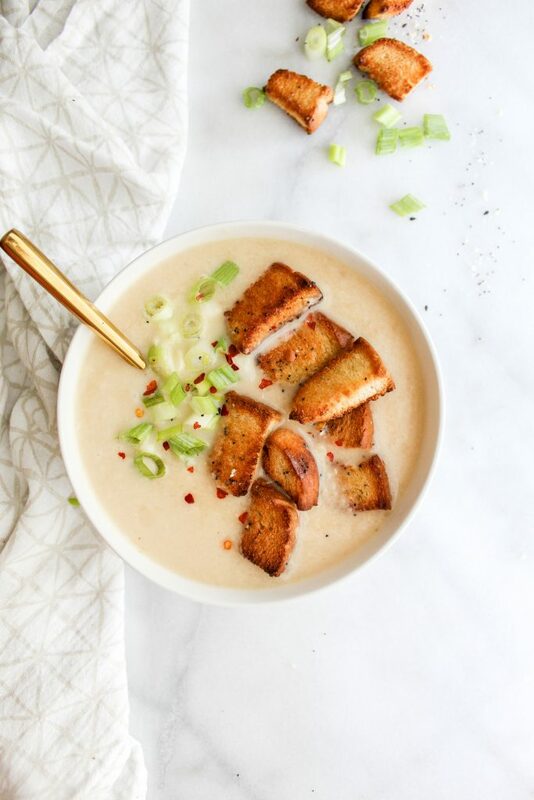 Top cauliflower soup with a handful of croutons, diced green onions and red pepper flakes! Eat while warm. Enjoy! Important note: Make sure that if you're using a blender that it's HEAT SAFE. If you aren't sure, let the soup cool completely before you blend it up and then warm it on the stove once it's blended and then add your cheese. Haylie you hit the nail on the head with this one. I had it over the weekend and I can’t wait to try it again when the weather gets cozy. Yay! So happy to hear that, Gabby! It is SO cozy. Awesome looking soup Haylie. Love the addition of my favorite seasoning on those croutons. Thanks, James! I love the everything bagel seasoning so much!! 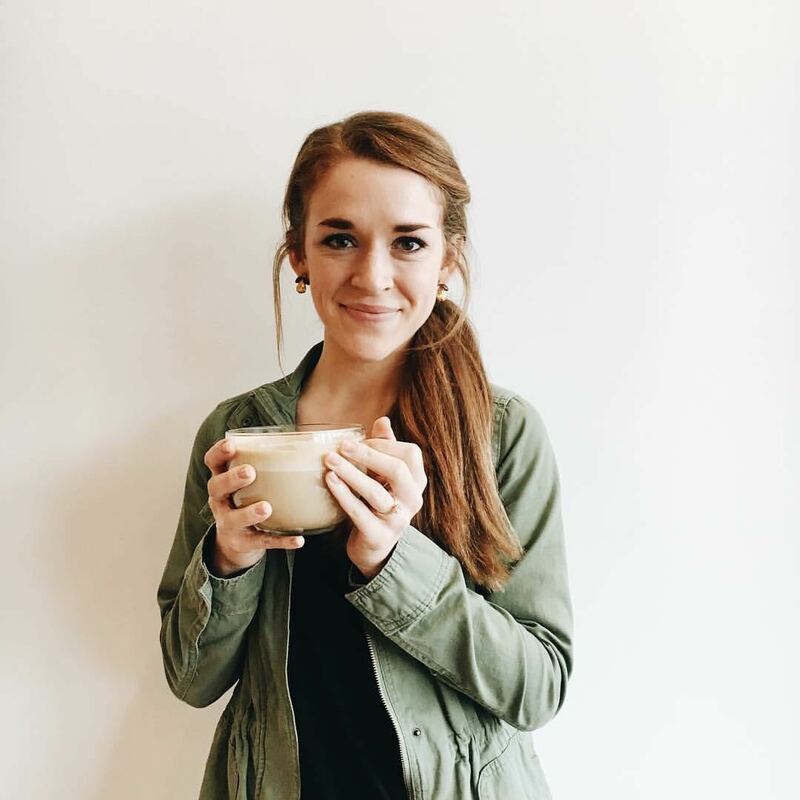 I cannot wait to make this soup Haylie! Looks scrumptious!